I gotta tell you, it’s hard to keep up with new marijuana strains. With marijuana legalized in several states, cannabis breeders are working overtime to create new marijuana strains. But most of the new marijuana strains are merely knockoffs of older cannabis strains. They aren’t worth the hype. Fortunately, the BigBudsMag.com marijuana grower team has access to the best new strains across America. Gorilla Glue: Like many new, superior marijuana strains, the genetic back-story on Gorilla Glue is murky. This version allegedly comes from an “accidental” cross heavy with Chemdog, Diesel, Chocolate Thai, and Sour Diesel genetics. Gorilla Glue got its name because it has exceptionally dense and massive resin production. Growers found that trimming and manicuring Gorilla Glue buds were exceptionally difficult because scissor blades actually got glued together by the resins. Gorilla Glue marijuana is perfect for making bubblehash, live resins, dry sift, and solvent or C02 cannabis extracts because every damn bud surface, including larger leaves and sometimes stems, are coated in gluey resin glands! Because Gorilla Glue #4 is mostly-Sativa and has Haze genetics, it can go tall, and it takes a long time in bloom phase (as long as 68-73 days). This marijuana strain likes intense light, and can handle higher than average heat and humidity. Gorilla Glue #4 is an ideal candidate for double-ended grow light grow rooms, which tend to run very hot and provide more light intensity than standard HID (high-intensity discharge) hydroponics lighting. Definitely top and train Gorilla Glue #4 plants to keep their height down and to increase density and yield. Gorilla Glue buds have a Haze smell more than a diesel smell, but when you smoke them, they remind you of Chocolate Thai or Chocolope. You get a very stimulating but also very heavy high from Gorilla Glue #4. Most of us who grow Gorilla Glue #4 are in the most legalized marijuana states like Colorado, Oregon, and Washington, where authentic clones are sometimes available. The only reliable place for Gorilla Glue marijuana seeds is here. I hope to see Gorilla Glue being grown in all 50 states soon! Bruce Banner: Another of the very popular new marijuana strains, Bruce Banner is known as one of the most potent strains available right now. It’s a relatively simple cross involving Strawberry Diesel, Strawberry Cough, and a rare OG Kush. The OG Kush involved in Bruce Banner marijuana is a “Ghost” cut that has also been part of the cannabis genetics for other famous strains such as Ghost Train Haze. Bruce Banner has several versions. Many people favor the phenotypes that are weighted towards the OG Kush genetics. I personally favor the Strawberry Diesel side. Depending on which phenotypes are expressing your garden, you’ll need at least 8-9 weeks in bloom phase, or as long as 10 weeks. I recommend pumping the flavor, bud size, and potency using Bud Candy and Bud Factor X throughout bloom phase. Look for a high that starts like a Sativa head high and then turns into a mellow but heavy Kush high. As with Gorilla Glue #4, Bruce Banner is most often procured via cuttings. However, at least one member of our grow team has been able to find reliable Bruce Banner seeds here. Cuvee, from TGA Genetics: Subcool and TGA Genetics are the most reliable breeders of exciting new marijuana strains in America. Subcool recently released Cuvee, a cross that includes rare old school genetics. Cuvee comes from a cross of Pinot Noir and Space Queen. Pinot Noir is a high-value clone-only marijuana strain combining Blackberry Kush and a Pakistani strain. Space Queen is an old school, now-discontinued TGA strain that was also known as Space Jill. Its heritage includes Romulan, Jack Herer, and Haze cannabis genetics. Because Cuvee has mostly Indica and Afghanica genetics, it naturally grows short and dense, producing thick nugs that have almost as much resin as Gorilla Glue nugs. It’s a fast-maturing marijuana strain that only needs 56-61 days in bloom phase. In our experience, Cuvee enjoys high-ppm feed programs. I ran 1400 ppm in grow, and 1300 ppm in bloom, using pH Perfect hydroponics base nutrients and matching Advanced Nutrients supplements. I never even saw a hint of overfertilization, such as leaf tip burning or nutrients lock-out. TGA Cuvee grows fast and has weighty flowers, so you’re advised to stake and train Cuvee whether you’re growing indoors or outdoors. By the way, if you haven’t grown TGA marijuana strains, you’re in for a treat. Subcool has created a unique class of new marijuana strains including the Jack the Ripper, Chernobyl, and Jill strains that have scents, tastes, highs, looks, and smells you won’t find in other marijuana strains. 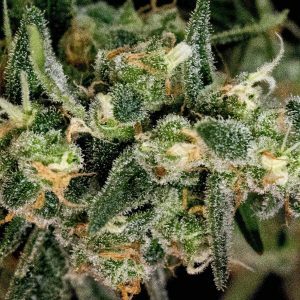 Amnesia Haze: Our marijuana grow team member Daniel Dharma turned me on to Amnesia Haze because it’s a very good marijuana strain for treating PTSD. Amnesia Haze has classic Haze smell and taste, and a very long (as long as 10-13 weeks) bloom phase. What’s really interesting is the Amnesia Haze genetic origins include Indica and Afghanica influences like Skunk and Northern Lights. The Indica and Afghanica influences make Amnesia Haze a big yielder compared to other Sativa-dominant strains, especially if your feed program includes pH Perfect hydroponics base nutrients, Big Bud, Bud Candy, Bud Ignitor, and Bud Factor X.
Tutankhamon (also known as King Tut): This is the most intriguing of the new marijuana strains we’re talking about today. It comes from cannabis breeders (Pyramid Seeds) who love AK-47, the famous “one-hit wonder” marijuana strain that’s been around for decades. Problem is, it’s hard to maintain motherplants and genetic stability for decades, and many growers complain that AK-47 seeds and clones aren’t as good as they used to be. The people who bred Tutankhamon worked hard to backcross and re-stabilize the most valued AK-47 phenotypes. In doing so, they created a relatively stable 80-20 Sativa-dominant marijuana strain that has two main phenotypes. One phenotype expresses a surprising amount of Indica characteristics. It’s a short, dense, high-yielding variation that can have as few as 62-66 days in bloom phase. The high is powerhouse, body-heavy, and crippling. The other Tutankhamen phenotype expresses mostly Sativa genetics. Untopped and untrained, it’s a lanky plant with a bloom phase that lasts from 67-76 days. It too has a sledgehammer high, but with more top-end and less body effects. One reason we like Tutankhamon is it’s a very forgiving strain. It can handle less than perfect temperature conditions, lots of nutrients, is resistant to gray mold and powdery mildew, and does well in Sea of Green or SCROG. The best results come with a conservatively-topped plant fed the full program of pH Perfect base nutrients, Bud Ignitor, Bud Candy, Big Bud, Overdrive, and Nirvana in bloom phase. If you’re a beginner marijuana grower, or a pro, you’ll love this exotic example of fantastic new marijuana strains. Please note that we’ve selected strains that you can find reliable cannabis seeds for. But as always when you’re ordering seeds, be cautious on your first order. Go with ordering a couple of individual seeds of each strain at first. One reason is to ensure you’re ordering marijuana seeds from a legit, honest online cannabis seed seller. The other is so you can test the germination rate, phenotypes, and overall suitability… to get exactly what you want from new marijuana strains. We know you’re going to enjoy growing these new marijuana strains!